We are a book-loving family. 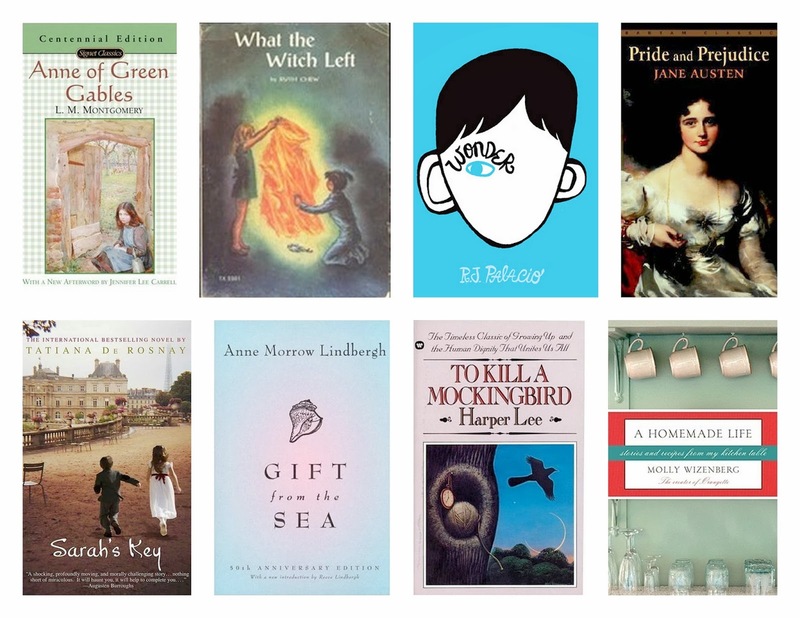 We read many books each month, but choose our favorites to share with you. We're always looking for more books to add to our library bag (which literally burst at the seams as we left the library one day). I'd love to hear your recommendations! This was a re-read for me, joining in with the Motherhood and Jane Austen Book Club. We are reading through all of Jane Austen's novels this year and interpreting them through the motherhood lens. Growing up with 4 younger sisters, I have always felt a bond to the Bennet girls. I am more grateful than ever that my mother is not at all a silly woman like Mrs. Bennet! Ellie and I both flew through this book in less than a day. It is sweet, sad and inspiring all at once. Molly's dad reminds me so much of my own that I was immediately absorbed by this book. So did the fact that we both grew up in households where good, real food and friends to share it with were prized above almost anything else. A lovely story about life, love and food. I've already made a couple of her recipes and, not surprisingly, they were delicious. Beautiful and timeless. I fell in love with Anne Lindbergh after reading her daughter's memoir No More Words: A Journal of My Mother Anne Morrow Lindbergh, and can't believe I've waited so long to read anything by Anne herself. I found I was writing down full passages in my commonplace book, I so loved her writing style and the imagery she used in writing about motherhood, womanhood and finding time to be quiet. Oh, how I adore this book! I re-read it this month for book club and loved it even more than the first time. It was especially poingnant for me after the adoption of our sweet Elijah. One of the best stories ever written about acceptance and the inherent worth of all people. This was another re-read for me, but the Anne series is at the top of my all-time favorites list. I adored sharing Anne with Ellie. And now Ellie talks about how "romantic" things are frequently. We read this aloud, but also listened to the audio dramatization on Librivox. We enjoyed it for the most part, but I must admit that a few of the voices drove us a little crazy. Diana Barry was played by an older woman, and it really didn't work for us. Luckily, we really liked almost everyone else. A cute, fun little story about everyday magic. I happened upon this while waiting for Ellie to gather some books at the library, and I'm so glad it did. Both Ellie and Ethan loved it and begged for more chapters each time we read. Also, check out our Olympics Study for more books we read this month. I know what you mean about Sarah's Key. I put off reading that one for a long time, because I knew it would be so heartbreaking. I don't blame you for not wanting to start it! I really love your list - lots of my favorites are on there. I've had Sarah's Key on my to-read list forever. It's time I break down and actually read it, I think. I'd be interested to hear what you think of Sarah's Key. My heart hurts just thinking about it, but I still loved it. I've had A Homemade Life on my Kindle for a while now - I'll have to add it to my virtual pile designated for next month. Great list here! Yes, you should! You'll love it. A Homemade Life was a re-read for me this month, it's so good! And I loved/didn't love Sarah's Key- heart-wrenching story that stayed with me for so long. I know just what you mean about Sarah's Key. It is a lovely story, but so sad. It does tend to stick with you. What a great list this month! I am starting Wonder tonight :) To Kill a Mockingbird is one of my absolute favorites and gets better every time - we are in the process of adopting, so I should probably read it again (I'd love that perspective too). I read War Brides this month, which reminded me of Sarah's Key, but not quite so vivid or heartbreaking. Thanks for sharing! I've never heard of War Brides, but I just requested it from the library based on your recommendation and I'm already drawn in by the cover. Thank you! I wish you good luck on your adoption journey! I know how hard it is to wait, my heart goes out to you. Great list! Anne of Green Gables and Pride and Prejudice are two of my favorite books. Very intrigued by Gifts from the Sea! It's a small book, but is so full of great insights. I loved it!